The ultimate permanent powder hair color for Long-lasting gray coverage. Easy to use: just add water. 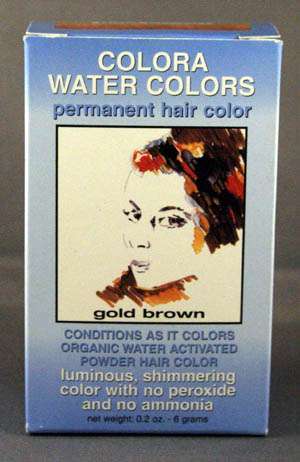 For natural looking color with NO peroxide and NO ammonia. 1. Shampoo hair (only if it is excessively oily) and towel dry. 2. Pour Colora Water Colors into a glass or plastic bowl and add 2 oz. (60 g) of warm tap water (about 6 Water Color containers) to the powder to obtain a gel-like liquid. Mix well. DO NOT USE WITH ANY METALLIC UTENSILS. 3. Apply Water Color on hair and leave on for half an hour. SHADES AVAILABLE: Black, Dark Brown, Brown, Chestnut, Burgundy, Mahogany, Light Brown, Auburn, Copper, Gold Brown, Blondine and Silver.